In one of the bigger pizza stories of 2018, Perfect Union Pizza — the pizzeria from chef Nick Badovinus — is finally open at Highland Park Village, on the ground level of the Highland Park Village Theatre. The restaurant takes over what has been a somewhat troubled space previously occupied by Marquee Grill and KT Burger. 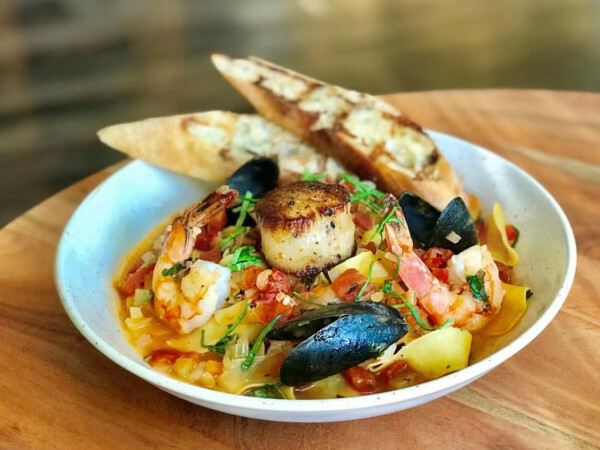 Those troubles are probably in the past, since Badovinus, who owns the Neighborhood Services chain as well as Town Hearth, Montlake Cut, and Off-Site Kitchen, has the magic touch in Dallas. 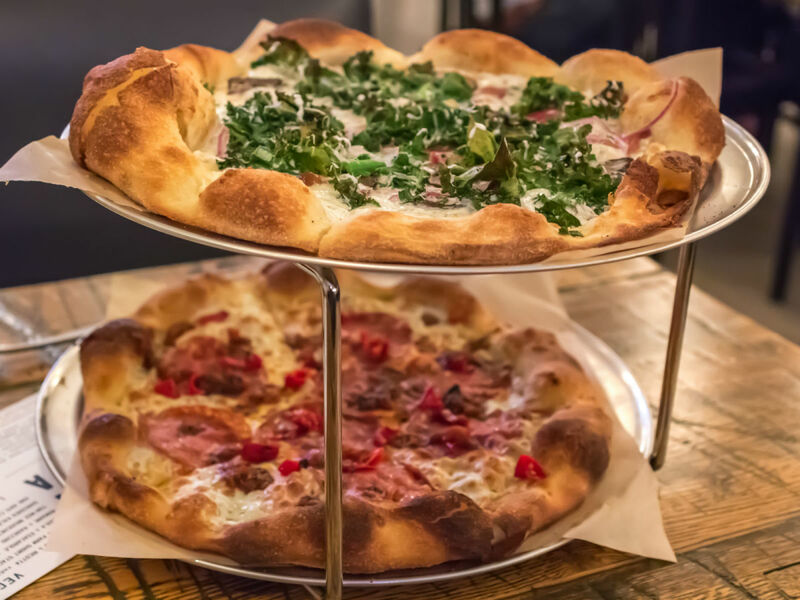 Badovinus has authority in the pizza realm, having founded Fireside Pies, the chain that first elevated pizza in Dallas as something more than throwaway chain fare. 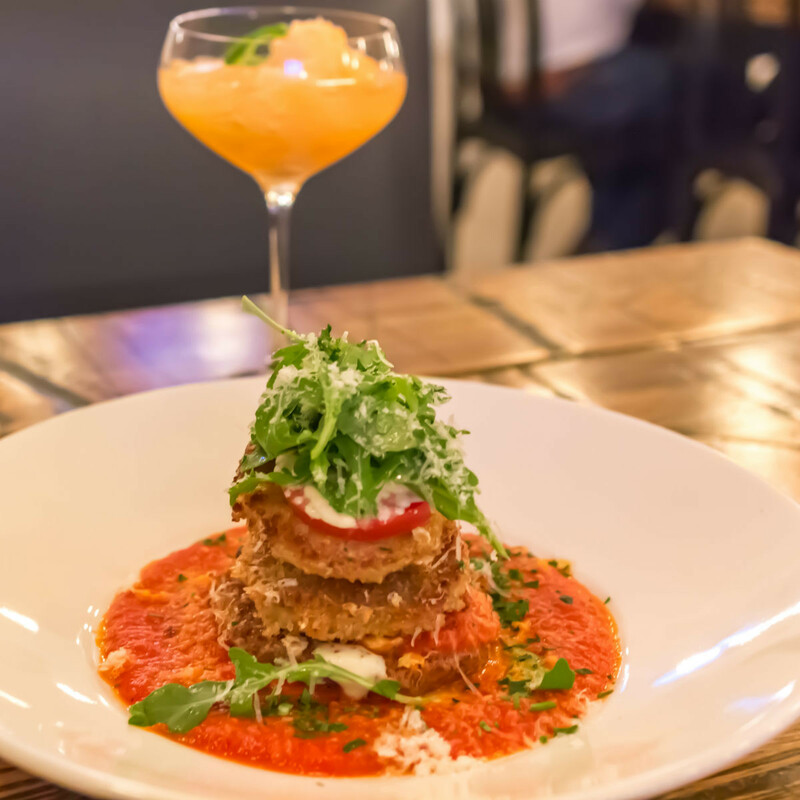 Perfect Union's menu consists mostly of pizza along with some Italian-American classics, in the vein of what Jay Jerrier and chef Lee Hunzinger have been doing at Zoli's NY Pizza, evident in dishes such as garlic knots and chicken parm. 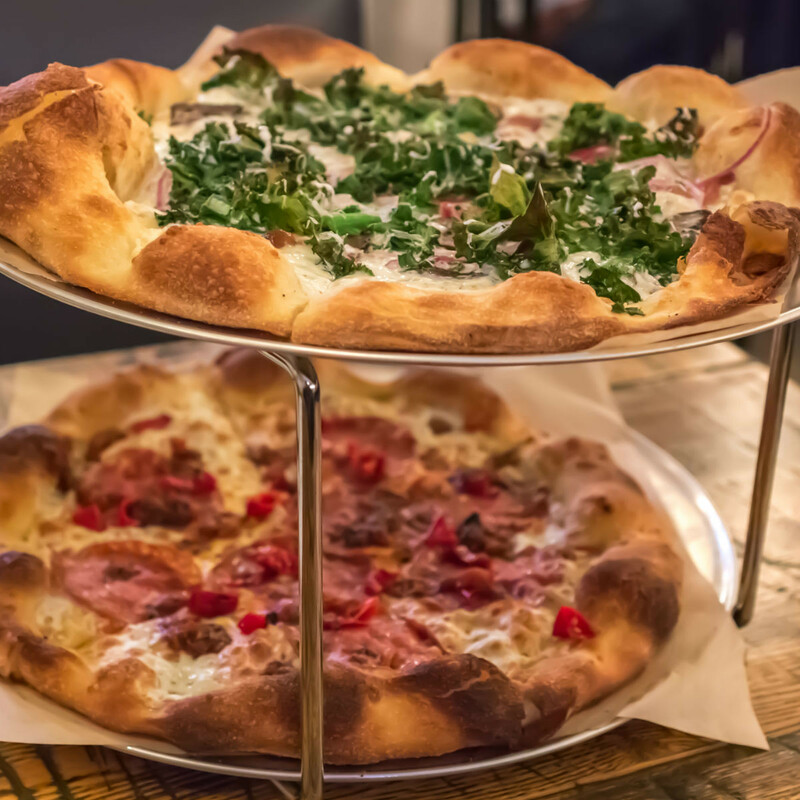 PU's pizzas come topped with high-end cured meats and cheeses such as soppressata, an Italian dry salami, and scamorza, a mild white Italian cheese. 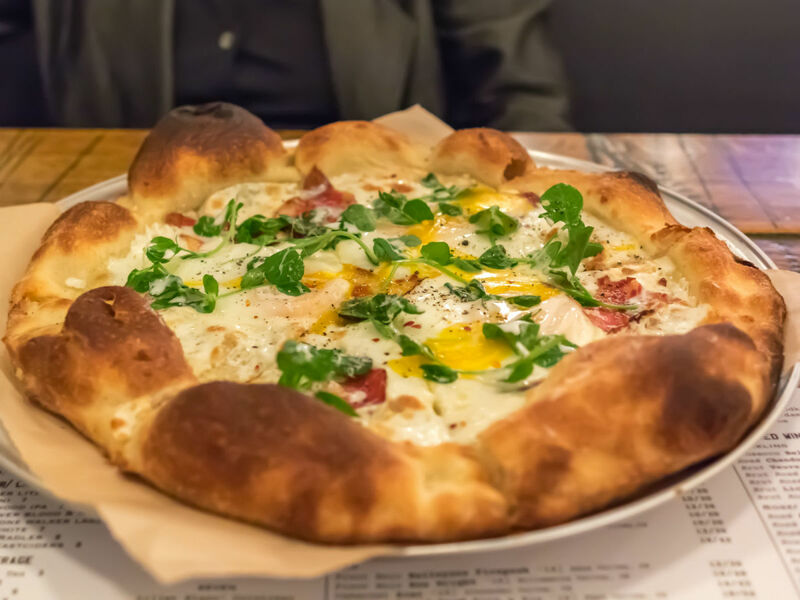 In the key area of crust, Perfect Union's is far thinner and more cracker-y than the softer, more pliable crust he introduced at Fireside, or that you find at Neapolitan-style pizzerias such as Cane Rosso. The dough is fermented for 24 hours; the longer a crust ferments, the more texture and flavor it has. They use a deck oven, and the pizzas bake at 700 degrees for about three minutes. When it arrives, the center of the pie is very flat and crisp on the bottom. The rim sports large brown bubbles which are crackly and delicate on the outside, full of air on the inside. There are a dozen pizzas, priced from $16 to $21, five of which are "red", seven of which are "white." New Jack Swing is a red pie with pepperoni, shishito, arugula, and red wine vinaigrette. A Purist is a white pie with tomato, red sorrel, salsa verde, and mozzarella. Zucchini Pie is a white pie with scamorza, sun golds, salsa verde, spiced yogurt, and escarole. Shredded Kale is a white pie with red onion, mushrooms, and bacon. Sausage is a red pie with scamorza, caramelized onion, and honeycrisp apple. My Sharona is a red pie with soppressata, charred pepperonata, and Calabrian chile. 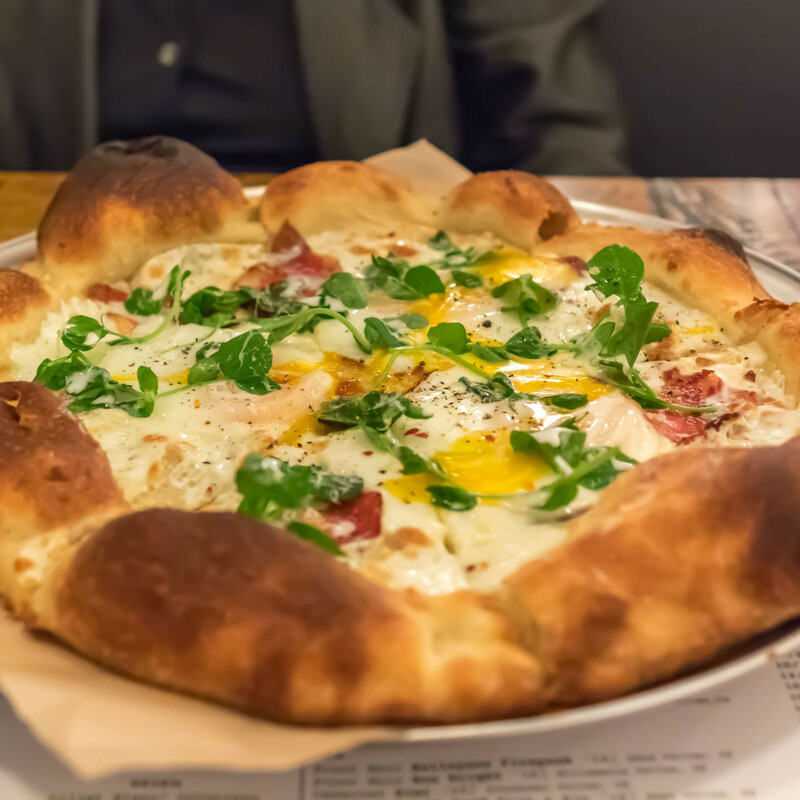 Johnny Slapps is a white pie with guanciale, broken egg, and pea tendril. Scampi is a white pie with rock shrimp, vodka sauce, red onion, and pea tendril. Our Usual is a red pie with sausage, black olives, and mushrooms. "#Jeff" is a white pie with scamorza, Canadian bacon, pineapple, shishitos, and red onion. 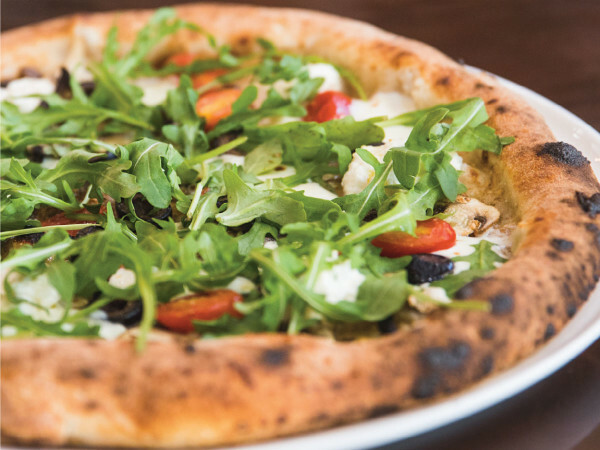 Parma Ham is a white pie with tomatoes, scamorza, red sorrel, arugula, chile flakes, and balsamic-fig dressing. Hey Meaty is a red pie with soppressata, Wagyu salami, sausage, guanciale, pepperoni, arugula, and pepperoncini. Half a dozen salads and vegetable dishes include caprese, kale, and bruschetta with ricotta, tomato, and mozzarella cheese. Starters include a fondue made from ricotta; charred shishitos; and fried zucchini with buttermilk dip. Warm carrots and ricotta ($10) was an unusual option with whole baby carrots cooked until just soft, set over a smear of ricotta, accompanied by arugula and radish in a toasted honey dressing. 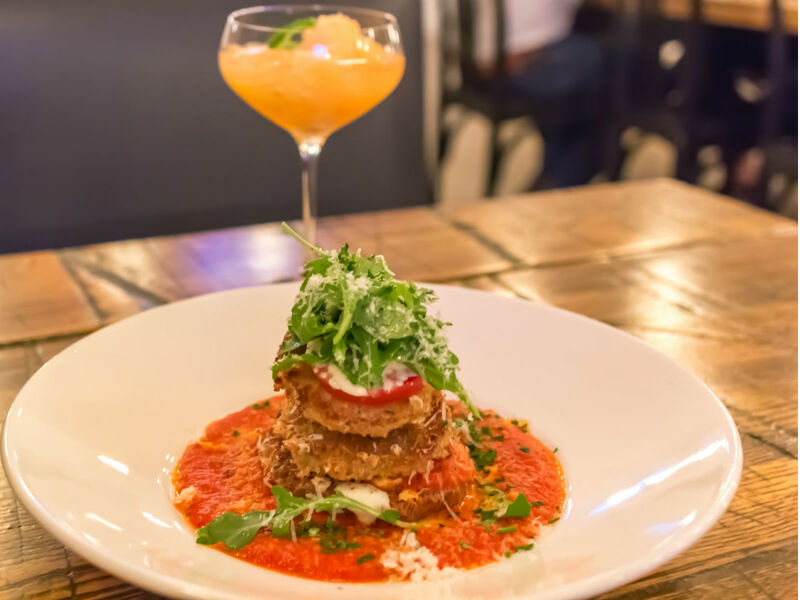 An eggplant parm short stack ($11) had three slices of eggplant in a panko-like breaded crust, interspersed with sliced tomato and mozzarella in a bed of red sauce — real comfort food. There's a pretty bar at the entrance, with 20 wines on tap, and another 18 available in bottles. Awesomely, seven of those bottles are sparkling, and six of those are rose. Now that's a wine list. Cocktails are intriguing and original, including three granitas — like a sophisticated version of a frozen drink, made with flattened chunks of ice. True to Badovinus form, the space is carefully conceived, but in a playful manner. 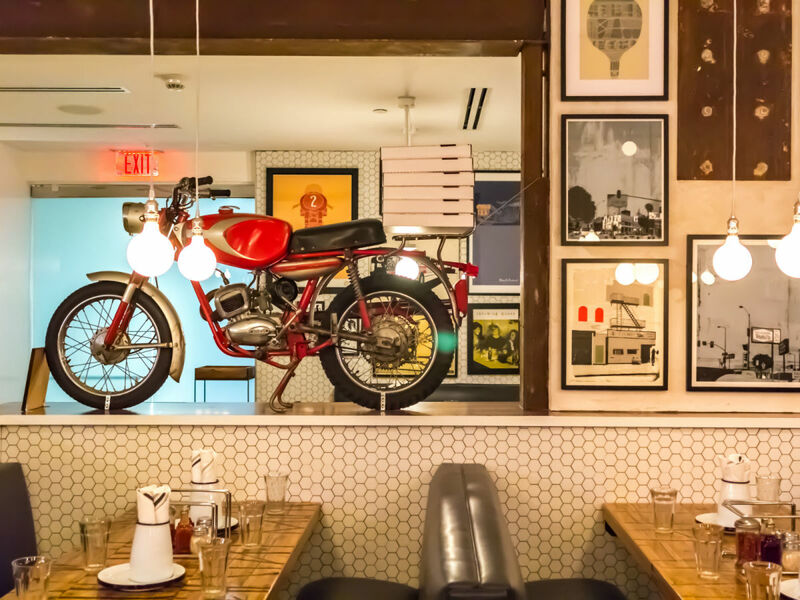 A Ducati mountaineer vintage motorcycle sits on a platform, serving as a colorful room divider. 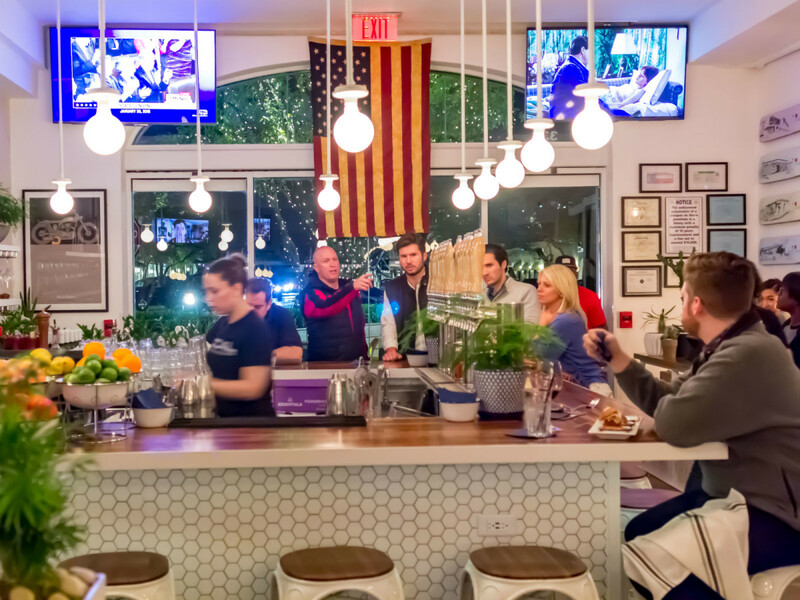 Booths made from rough-hewn wood with a coat of gloss are big and roomy; a community table runs down the center, broken up nicely by potted plants. The walls are lined with skateboard decks by artist Evan Hecox. A lyrical installation of decks hanging over the kitchen traces a day from sunrise to sunset. Lighting is warm, subdued, and flattering. The whole thing feels effortless and retro. HD TVs air movies from the '80s like Weird Science. "Pizza has an adolescence to it," Badovinus says. "I asked my staff, 'Have you ever snuck a beer before you were 21? Did you ever get pizza with your friends? We've all done this before.' 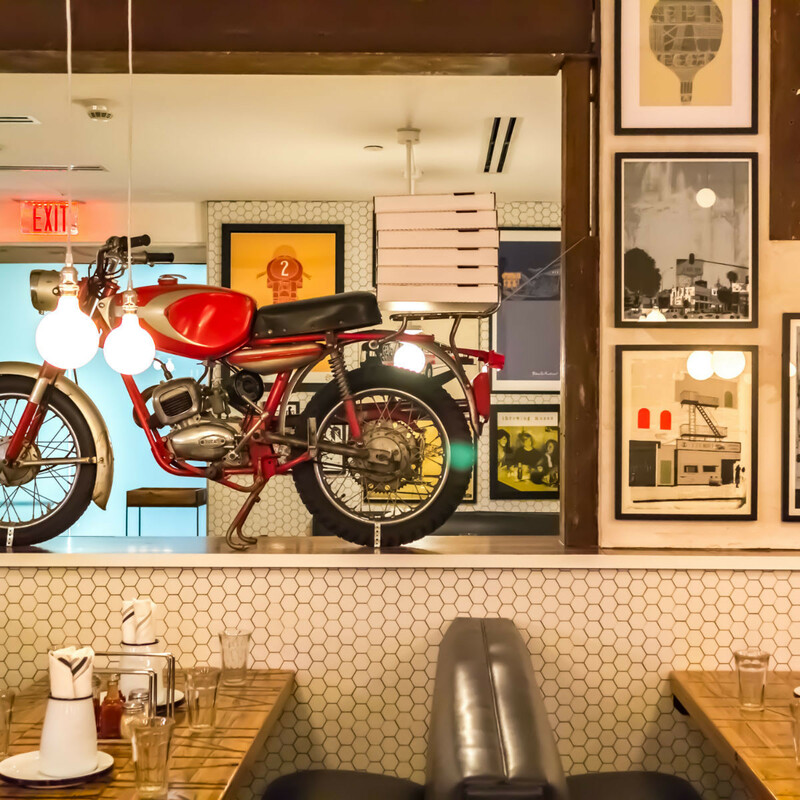 There's always been a youthful innocence surrounding the pizzerias I went to growing up." 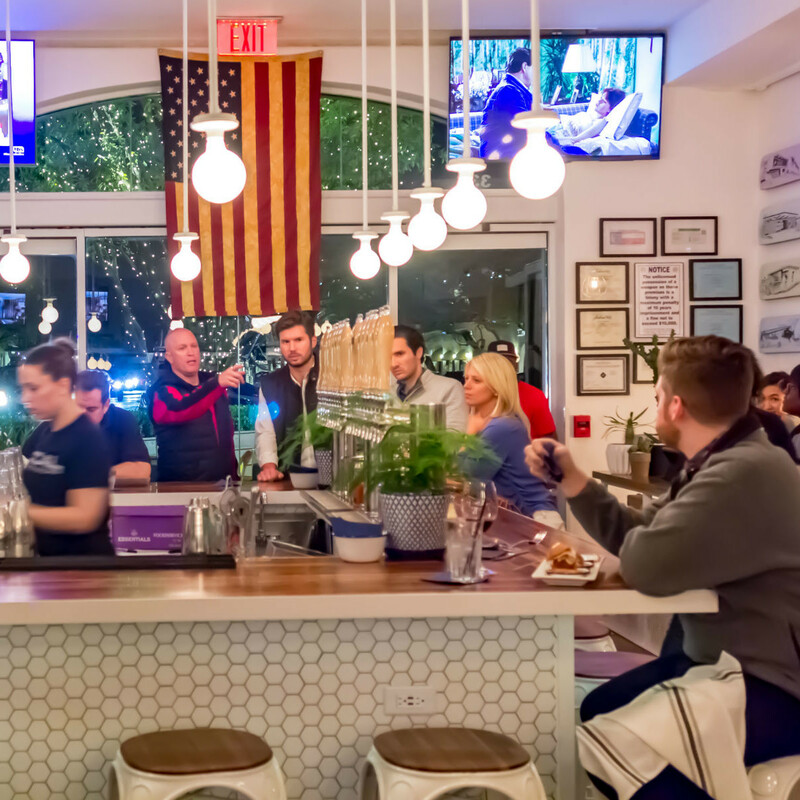 Perfect Union is now open for dinner only, but will add lunch hours in about a month.